Kyla Nim is our protagonist. She has grown up in the secluded forest village of Aspengrove about eighty miles east of Equinox. Because of her secluded and sheltered upbringing, Kyla knows little of the outside world besides what she has heard in stories. She has also lived a simple life, mostly just playing in the woods. Elves do not have a structured education system for children, and as such Kyla has grown up without learning many of the social and academic basics we would consider typical of a young woman her age. This makes her come across as childish and immature at times, though it has also helped her maintain a cheerful disposition and energetic optimism. Her innocence and naivete rub some people the wrong way, but endear her to others. The heroic arc of Kyla was intended to focus on different traits than many other stories. Kyla is not the chosen one. She isn't the fastest, the smartest, or the most beautiful. Her heroic strength lies in her willingness to tackle any challenge, her compassion for others, and her courage. She is much like Frodo Baggins from Lord of the Rings, in that she is a hero simply because of her willingness to take the mantle. 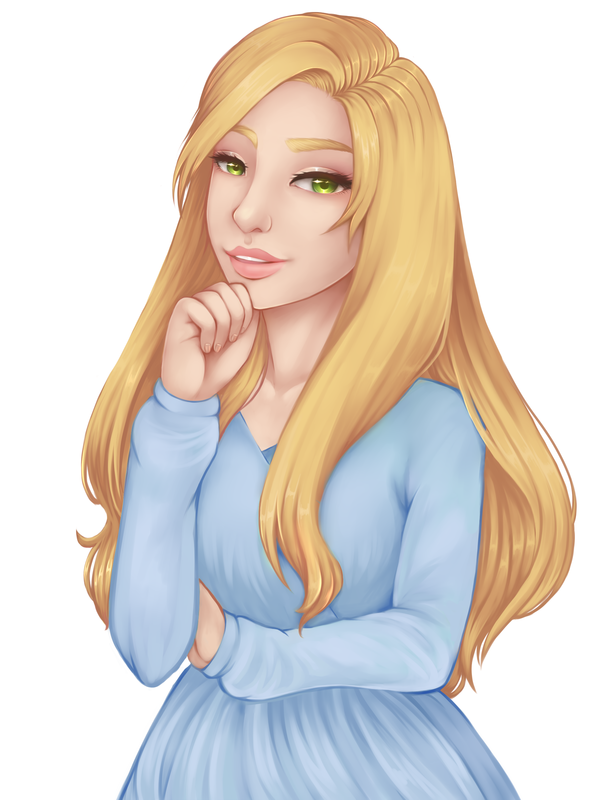 The primary focus of Elf Mastery is Kyla's development and maturing throughout the story. While many main characters are given bland personalities to make them easier for readers to identify with, I wanted her to have a lot of flavor to her character. I knew this would make her less palatable for some readers, but endear her more to others. Beta reading seems to have proven this, as some of my beta readers loved her and some hated her. I am happy to say, though, that by the end of the book she had grown on most of the readers who didn't like her in the beginning. She is my favorite character, and that is likely because she is the one I spend the most time developing. Artwork for the pictures on this page were done by TheAvies on deviantart. It is the base drawing used on the cover of the book. Eunoe (Yoon-way) is an alseid, a type of nymph associated with glens and groves. She is from a forest called Arkwood a couple hundred miles south of Equinox. 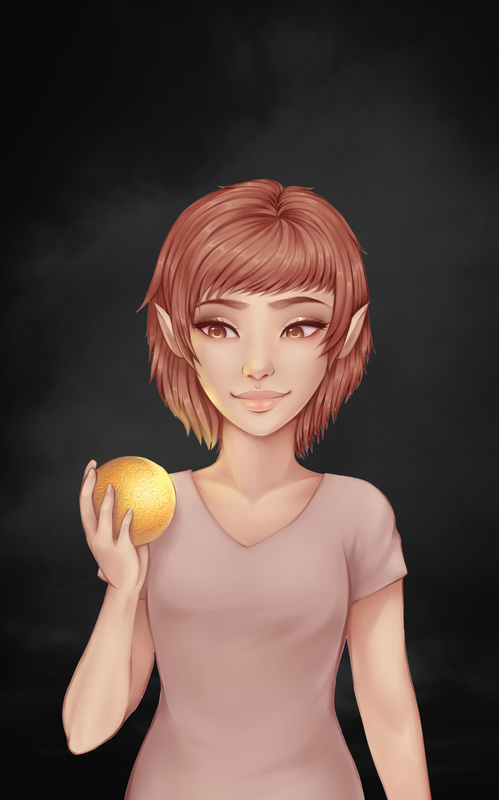 She is from a Charm (group of nymphs) in Arkwood led by a Doyenne (leader) named Eunoste. She likes to create new animal designs by knitting DNA, and is obsessed with giving creatures wings. She was based on a character named Marcella from the story of Don Quixote. Beautiful and sought out by many suitors, she has no interest in men and prefers spending her time in peaceful solitude (well, she's almost always with Aspen). She has the ability to entrance people and animals by catching their gaze, which locks their eyes with hers and forces them to relax. Eunoe left her Charm because of an encounter with a satyr named Elson, and the resulting victim-shaming of her peers. Though the details of this incident are never divulged, she has developed a distaste for men in general and in particular dislikes satyrs. 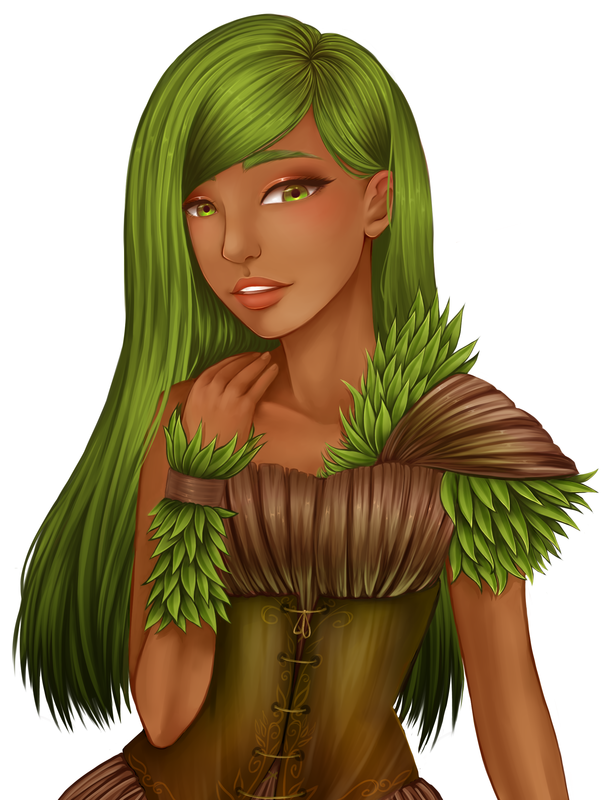 Aspen is a dryad, a nymph associated with a tree. She was once the soul of a cherry tree, but about fifty years ago her mother tree was burned in a forest fire. She was nearly killed herself, and lost all her memories. Eunoste, the leader of Eunoe's Charm, used soul-weaving to attach Aspen to Eunoe. Now Eunoe has taken place of Aspen's mother tree, and the two souls (and lives) are tied together. Unable to be more than a mile apart, lest the bond weaken and Aspen die. This means the two have spent the last fifty years in close proximity, and though they are very fond of each other Aspen does get annoyed with Eunoe's dominant personality. She also depends on Eunoe's strength, however, and can get in a panic if Eunoe isn't around to deal with a stressful situation. Aspen is a plant-singer, and sings to trees and flowers to carry them through their life cycles. Aura is a Daughter of the Air, the ninth child of Duke Ukko, Lord of the world's weather. Raised in a wealthy home of aristocrats, she spent most of her childhood with nannies and tutors. Though she wears her rank with pride, she despises many of the habits and manners of the aristocracy and has chosen to attend Equinox and live like a commoner. She is not afraid of hard work, and is both a student and a teacher at the school, instructing a beginner course in Breezes. Aura is Kyla's roommate, and though she is always polite and kind, she is a loner by nature and Kyla struggles to get to know her. What is learned is that Aura has serious issues with her father, whose authority she frequently challenges. SHe doesn't like to be bossed around, nor does she care to boss around others. Aura likes to know her task, and to do it undisturbed. An air spirit, Aura can fly, turn into a rush of air, and become invisible. Her degree of opacity/transparency is often indicative of her mood, though she can consciously make herself as visible (or invisible) as she desires.